The Japanese investment firm, DOWA, must do the responsible thing and back out of a mining project that could decimate native salmon. 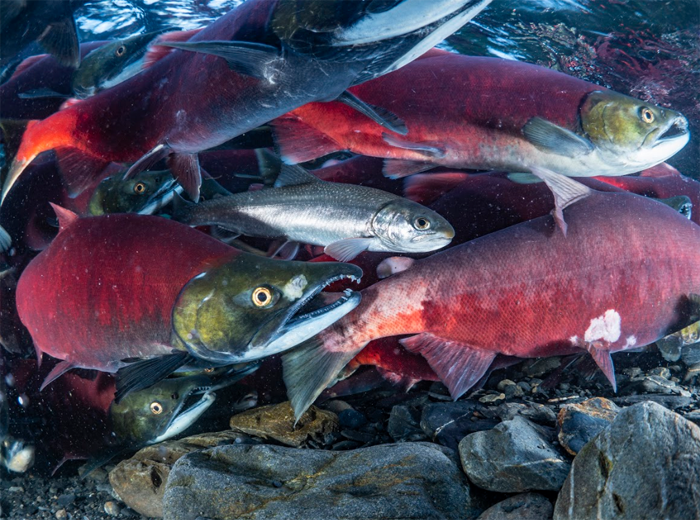 Sockeye salmon, Chilkat River, Alaska. Photo provided with permission courtesy of American Rivers – photographer Connor Gallagher. American Rivers today released its annual list of America’s Most Endangered Rivers®, identifying ten rivers facing imminent threats. This year’s report spotlights the threat that climate change poses to rivers, clean water supplies, public safety and communities nationwide. 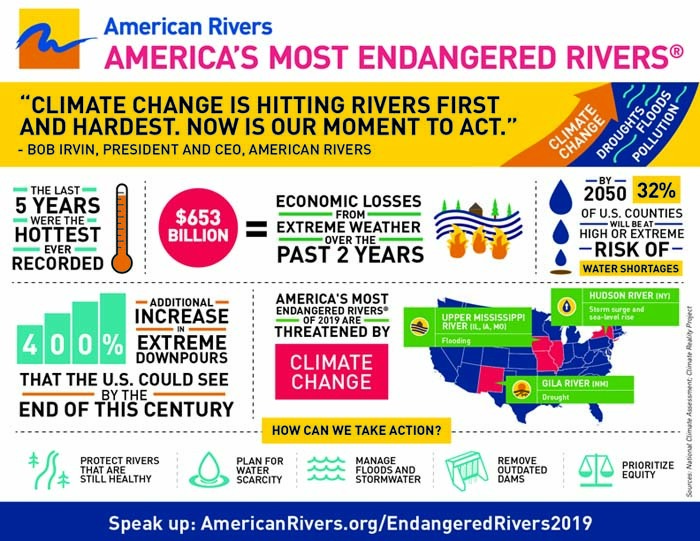 From water scarcity on New Mexico’s Gila River, named the #1 Most Endangered River in the country, to sea-level rise on the Hudson and flooding on the Upper Mississippi, America’s Most Endangered Rivers of 2019 illustrates what’s at stake and the choices facing communities. Climate change is the most consequential environmental challenge facing our planet. In the U.S., cities are struggling to do more with less water, fish and wildlife are struggling to survive, forest fires are growing more destructive and storms are triggering more life-threatening floods. In March, record flooding across the Midwest killed at least four people and cost more than $3 billion in property damages in Nebraska and Iowa. The harshest impacts of climate change are often most prevalent in communities of color and economically disadvantaged communities. #1 Gila River –The Southwest is becoming hotter and drier due to climate change. Building a costly new diversion and compromising river health doesn’t make sense when there are cheaper, more effective water supply alternatives for the region. #2 Hudson River – Rising sea levels resulting from climate change threaten New York City. Instead of installing massive storm-surge barriers that would damage this rich estuary ecosystem, we must find better, more reliable and flexible solutions to protect people and property. #3 Upper Mississippi River –Increased flooding is occurring throughout the Upper Mississippi basin due to climate change. Choking the river with new levees and traditional flood control structures threatens public safety by making flooding worse downstream. “Our nation is at a crossroads. If we continue to degrade and abuse our rivers, we will compromise our ability to deal with increasingly severe droughts and floods. But if we protect and restore our rivers in thoughtful and equitable ways that do not perpetuate the mistakes of the past, we can strengthen our communities and create a more secure future,” Irvin said. In addition to announcing the nation’s ten endangered rivers, American Rivers honored Ohio’s Cuyahoga River as “River of the Year.” The title spotlights the river as a national success story and celebrates the progress Cleveland has made in cleaning up the Cuyahoga, fifty years since the river’s famous fire that sparked the nation’s environmental movement. 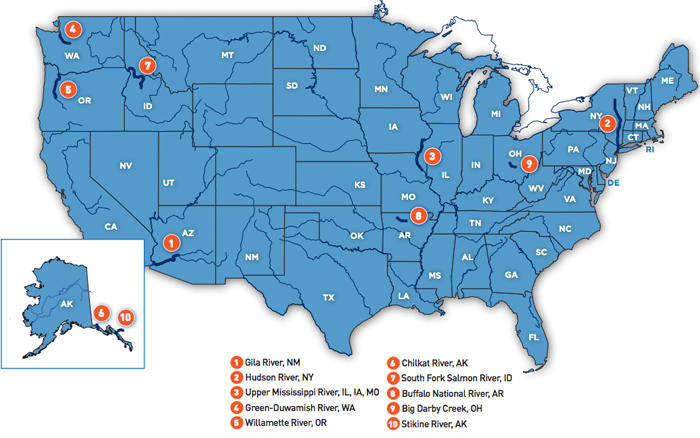 In its 34th year, the annual America’s Most Endangered Rivers® report is a list of rivers at a crossroads, where key decisions in the coming months will determine the rivers’ fates. Rivers are chosen for the list based on the following criteria: 1) The magnitude of the threat, 2) The significance of the river to people and nature and 3) A critical decision-point in the coming year. Over the years, the report has helped spur many successes including the removal of outdated dams and the prevention of harmful development and pollution. American Rivers believes every community in our country should have clean water and a healthy river. Since 1973, we have been protecting wild rivers, restoring damaged rivers and conserving clean water for people and nature. With headquarters in Washington, D.C., and offices across the country, we are the most effective river conservation organization in the United States, delivering solutions that will last for generations to come. Find your connections at AmericanRivers. Read the full report here . . .